Green bean seedlings are easy to identify in the garden because of their size and shape. Germinating bean seeds is also an educational activity for kids. Seeds may be started in a cup of soil or even on a damp paper towel, where the entire germination process is visible. Bean seeds germinate best when soil temperatures are between 70 to 80 degrees F. At optimal temperatures, they germinate in 8 to 10 days, according to Cornell University. They germinate slowly, or not at all, when soil temperatures are below 60 degrees F. Bean seeds thrive when planted in late spring, when all chance of frost is passed and daytime temperatures are consistently above 70 degrees. F.
Bean seedlings are among the largest in the vegetable garden. The first sign is a hook shaped stem emerging from the soil. A single green lobe sits atop the stem and the split seed coat may still be attached. Within a few days, two kidney shaped lobes grow on either side of the stem, which now stands tall. Soon, two real leaves emerge. The leaves are heart shaped and a deep green. Beans are categorized several ways. Pole beans refer to beans that climb on long vines, reaching to 10 feet high and need a trellis or stake for support. Bush beans are compact and require no support. 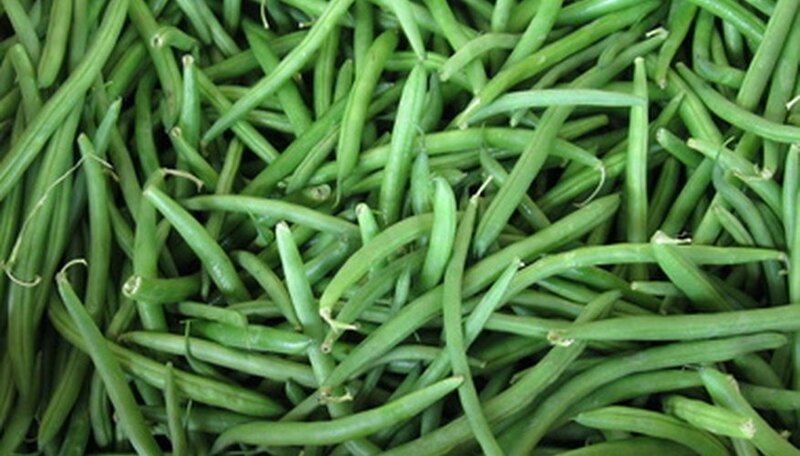 Snap beans are those that are eaten fresh. Dried bean varieties, such as kidney, pinto and black bean, are used for the beans found inside the shell. These beans are dried and used in soups and stews. Beans need full sun and at least 1 inch of moisture per week, especially during flowering and bean production, according to Cornell University. They have shallow roots and are easily damaged by cultivation. Beans taste best when they are harvested while young. The pods should be about the diameter of a pencil. They may be eaten fresh, canned or frozen. Bean seeds don't germinate well in very wet conditions and the old advice to soak bean seeds before planting may actually damage the seeds. Additionally, bean seeds don't transplant well and should not be started indoors. They grow best when planted outdoors in evenly moist, not soggy soil.